Poorly gaged streams far outnumber well-gaged streams. Discover the largest gaps by watershed, explore where inactive gages offer opportunities for renewed efforts, and learn who is funding gages. Gage Gap is a tool for identifying areas of the state that need improved stream monitoring systems. Stream gages provide essential information about one of California's most precious resources — water. Gages that are actively reporting and well-maintained help the state properly allocate water resources for people and nature, adapt to climate change, and anticipate potential flooding. Gaps in the stream gage network make it much more difficult to ensure that both people and nature are getting water when and where they need it. This tool highlights the major gage gaps and ways to fill them. The Gage Gap tool was built to help understand the status of stream flow monitoring across California. Making use of existing stream network data, we were able to track the path of a stream to determine what sections of a stream are currently monitored by a gage. Robust geospatial data on streams was available from the National Hydrography Dataset (NHD Plus V2), including stream network connections, flow, drainage, and stream name. We created a database of gage locations and status by combining six existing datasets of stream gages in California (See the list of data sources below for more detail). 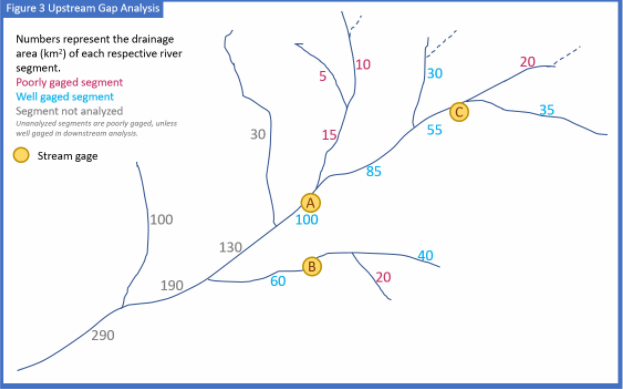 By snapping each gage to the stream it monitors, a network analysis became feasible. To start, any stream segment with an active gage along it was considered to be well gaged. Data from a stream gage can be extrapolated both up and down stream of the gage location, so we applied two network tracing tests, one for upstream, and a second for downstream. Both are described in more detail below. The gap analysis relies on the drainage area of each stream segment, as provided by NHD. Drainage area is a measure of the land area that drains into a stream segment. The drainage area for any stream segment is always the sum of the contributing segments' drainage areas. For this reason, the drainage area increases as you move downstream. 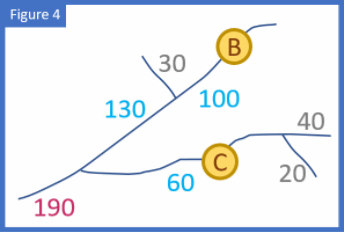 Figure 1: A hypothetical stream network (blue) with the drainage area in km2 for each stream segment represented by the black numbers near the stream. Starting at the headwaters, each stream's drainage area is added as it merges with other streams in the network. On the left map, the confluence of the 20 km2 and 35 km2 segment results in a 55 km2 segment. The next confluence is 30 km2 and the following segment becomes 85 km2. The goal of upstream analysis was to measure how far upstream a gage could monitor. Using the principle applied by USGS1 it was determined that a drainage area upstream of a gage was sufficiently monitored until the drainage area of that upstream segment falls below 50% of the drainage area at the gaged location. In other words, as you move upstream the drainage area of the stream segments decreases. Once the drainage area of the ungaged stream is less than half of the gaged stream, the data from the gage is no longer informative to estimate flows in the ungaged stream. Figure 2: Gage A is an active gage on a stream segment with a drainage area of 55 km2. All upstream segments are considered sufficiently monitored unless the drainage area falls below 27.5 km2 — 50% of 55 km2. On the left map, the upstream segment with a drainage area of 35 km2 is well gaged (35km2 / 55km2 = 64%), while the upstream segment with a drainage area of 20 km2 is Poorly Gaged (20km2 / 55km2 = 36%). The 30 km2 segment is not upstream of the gage and not analyzed. In a similar example, on the right map, the upstream segments with drainage areas of 20 km2, 10km2, and 15km2 are all Poorly Gaged. Below is an expanded view showing how segments are analyzed across a stream network. Segments are analyzed in an upstream direction, starting at each segment with an active gage. Connected upstream segments considered "Well Gaged" until the drainage area falls below 50% of the gaged segment's drainage area. 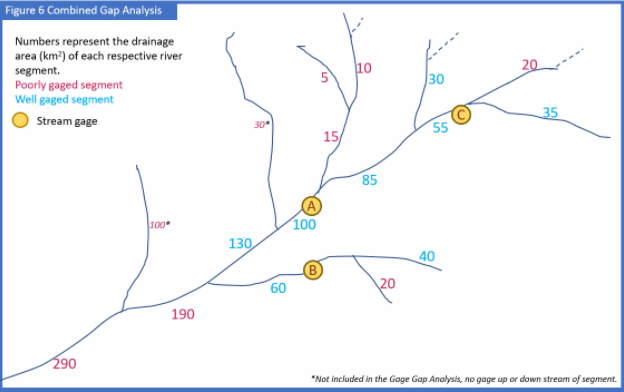 Figure 3: The streams with drainage areas of 15 km2, 5 km2, 10 km2 are less than 50% of the drainage area of gage A and therefore poorly gaged. The stream with a drainage area of 55 km2 is well gaged, as is the 35 km2 stream north east of it. The stream with a 20 km2 drainage area is poorly gaged, as it is only 36% of the gage A drainage (55km2). The segments with a drainage area of 290 km2, 100 km2, 190 km2, 130 km2, and 30 km2 (on the west side of the map) are not analyzed because there are no gages downstream of them. As you move down the stream from a gaged location, it is well gaged until the drainage of the stream segment exceeds 150% of the drainage area of the gaged location.The downstream analysis threshold of 150% was taken from the USGS guidance and applied to the stream segments downstream of gaged locations. Figure 4: Gage B is on a segment with a 100 km2 drainage area. The segment immediately downstream is 130 km2 (130%) and therefore well gaged. Gage C covers a drainage area of 60 km2. The stream segment of 190 km2 is poorly gaged, as it is 317% of gage C and 190% of gage B. The segments of 20 km2 and 40 km2 are upstream of any gages and therefore not analyzed. Per USGS guidance, gages should be reviewed individually; therefore the drainage areas of gages B and C cannot be added. The expanded view below details the downstream analysis over a larger network. Stream segments are analyzed in a downstream direction, starting at each stream segment with an active gage. Connected downstream stream segments are analyzed until the drainage area rises above 150% of the gaged stream segment's drainage area. Figure 5: The segments with drainage areas of 190 km2 and 290 km2 are more than 150% of the drainage area of gage A and therefore poorly gaged. The segment with a drainage area of 55 km2 is well gaged, the 85 km2 segment south west of it is poorly gaged (154%). The segments with a drainage area of 30 km2, 15 km2, 5 km2, 10 km2, 30 km2, 20 km2, 35 km2, 40 km2, 20 km2 (on the east side of the map), as well as the 100 km2 on the west, are not analyzed because there are no gages upstream. To be well gaged, a stream segment can be gaged in either the upstream or downstream location or both. To reflect this, the Gage Gap analysis combined the two analyses described in Figures 3 and 5. Lastly, any segments not analyzed in the upstream or downstream script were defined as poorly gaged. The combined results are show below in Figure 6. Figure 6: The magenta numbers represent a stream segment that is poorly gaged in both up and down stream directions, or not analyzed because there is not up or down stream gage. Blue figures indicate stream segments well gaged by a gage on the segment, either upstream or downstream. The 5 km2 threshold was validated with a review of existing stream gages. Over 85% of known gages are on streams with a drainage of 5 km2 or more. Only active gages were included in the analysis. Gage adequacy calculations were run in a PostGIS database through two independent scripts, using the Psycopg database adapter for PostgreSQL. The results were then combined in Esri ArcGIS software. Many agencies are involved in stream gages. The gage database only focused on gathering gage data from agencies with a large number of gages. Not all gages are included in the database. The process of merging the seven datasets resulted in duplicate gage records. Multiple reviews were done to remove clear duplicates. The gage gap database likely still has some duplicate gage records. Because the existence of a gage in the analysis is binary, duplicate gages do not affect the results. Attributes for gages were collected from multiple sources and are incomplete, and some may be out of date. Information about agency involvement in gages (owner, operator, maintainer, reporter, funder) is very limited. The values are most frequently from the USGS website, under current conditions for the gage, and is of unknown accuracy or vintage. Gages were snapped to streams for analysis, but displayed locations are those reported by the agency and may not fall visually on the stream. The NHD Plus database is a 1:100,000 data set. More detailed datasets are available and include smaller hydrological features. The Gage Gap application only includes linear hydrological features with a drainage area of 5 square kilometers or more. Artificial, reservoir, lake and pond features were removed. Attributes are not complete for all streams in the NHD database. Streams without a drainage area were not analyzed. The edges of some watersheds do not topologically align to the hydrologic regions. Each watershed has been assigned to one, and only one, region. Project Contacts: Kirk Klausmeyer kklausmeyer@tnc.org, Amanda Recinos amanda@greeninfo.org The GIS files used in Gage Gap are available for download. Contact Kirk Klausmeyer for the full database of gages and streams. Extended methods and metadata are also available.